Bring a little bit of paradise to your doorstep. 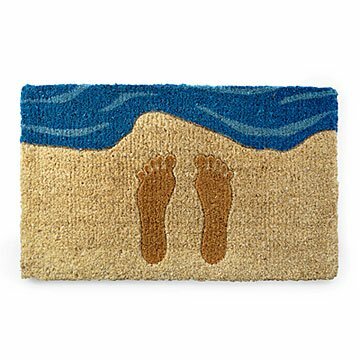 Designed to bring a little bit of paradise to your doorstep, this coir doormat features two footprints at the edge of a bright blue ocean. It'll turn every walk to your front door into a walk on the beach—just remember to wipe your feet. Footprints are ten inches long (a women's size 9.5 and a men's 8.5). Made in India. Loved how different this is. Perfect for a beach house. This mat was super cute, nice thick mat. It was put on the back deck in the shade. Looked great. Only issue is that the colors all faded very quickly. The feet were gone with in a few weeks and the water shortly there after. We now just have a brown mat. We go to our friends beach house and bring a gift. This is perfect. Thought this was the perfect gift for a friend's newly constructed beach home. The blue in the water design even matched the siding on the home. Presented this as a housewarming gift in July. First visit to paradise and the beach mat is at the covered, shaded, front entry way, but design is faded. Recipient didn't complain, but I was very disappointed and somewhat embarrassed. Know these fiber mats don't last forever, but lost it's color and appeal in a little over 2 months? Just a heads up! This mat is unique and practical. Well made. Very cute design. Practical yet fun. Be at the beach every day! This is the perfect entry piece for my beach house. This is part of a beach-themed wedding gift for people getting married...on the beach! I know they will love this and I'm glad I found such a perfect gift!